The second day we spent in Vienna (well actually more like the second half day), was a day with a planned visit. 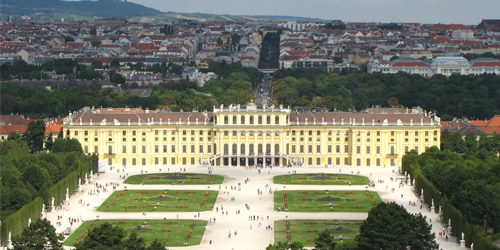 We planned to visit the summer residence of the Habsburg monarchs: Schönbrunn Palace. We planned the visit to have a length of about three hours, visiting mainly the sites included in the Classic Pass at the time of our visit: a Grand Tour of the palace, a visit to the Crown Prince Garden, a visit to the Maze&Labyrinth and access to the top of the Gloriette. A fun fact about how the tickets are actually being sold at the place: you buy your ticket at the ticket shop (which was by the way really fast), you get a time-slot imprinted on the ticket showing you when you can actually get into the palace, and then you wait for that time and just go ahead and skip the line (full of all the others, who did not notice the time-point imprinted on the ticket and continuously get turned around at the entrance) to enter the palace. The big problem here, was that it was forbidden to take photos: I do not know how much it would have cost to get a permit, but I guess a lot, because nobody took photos 🙁 . The best view of the castle (and of Vienna), however is on top of the Gloriette. One must pay to get on the top to the viewing terrace, but luckily this was included in the classic pass, so we did not have to pay. Although it is quite a long walk to get up to the Gloriette, especially on a warm day, it is worth it, and I would advise anyone to make the effort and just get up there 🙂 . The next stop after our short visit to Budapest was Vienna. It was not the first time for me in Vienna, but since the first visit took about 18 hours out of which I was sleeping for 12, I guess I thought there is much more to be seen in that city than one can do in 4 hours. The second visit was not too long either, we planned one afternoon and one morning/noon for the visit. The first thing to think of, when visiting a city, is finding a good place to stay. Having in mind that we are talking about Vienna, finding accommodation at a reasonable price is not exactly easy. In the end we settled for a hotel in Hernalser Hauptstrasse, from which we could easily access any part of the city (i.e. close to public transportation). It was also important to have a place to keep the car at. This place we stayed at offered an acceptable deal for a place in a ‘garage’ and they were flexible enough to allow us to leave the car a few hours longer than normally possible. Also we found out at the reception, that the local police is very fast in detecting illegally parking cars, so they offered us a flyer to put under the windshield even for the 10 minutes it took for us to register. 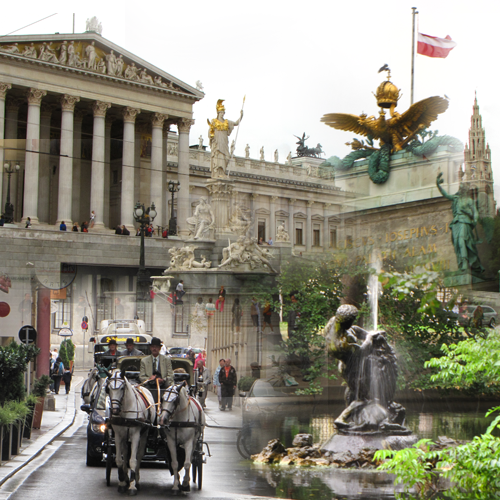 The first afternoon/evening in Vienna was dedicated to the city center. We just had to buy a 24h ticket at a tobacco shop(€7.10) and we were off (just make sure you validate your ticket after getting on the tram). From the hotel we stayed at, we only needed to use a single tram which took us to the intersection of Universitatsstrasse and Schottenring. From there, using a map, we strolled along Town Hall (Rathaus), the Austrian Parliament Building, Hofburg and its surrounding parks and, of course, Stephansdom. We only entered the cathedral and none of the other historic monuments from the list above. We figured we’d leave the museum visit to the next day to a different castle, although, the museums in Hofburg are also quite interesting. The most important part with this stroll, was that it was easy and the aim was to get a feeling of the city. And the feeling was as expected: an extremely clean, royal feeling of a city with lots of expensive shops, wide open squares and massive baroque buildings… In one word? … Elegant. Although it seems a pretty expensive city, there are opportunities for ‘normal’ people also to have a coffee, have dinner or just to buy an inexpensive souvenir. We had coffee/tea just next to Stephansdom in a coffee-terrace in the middle of the street for less than €6, which, considering the Gucci, Armani caliber shops around it, was pretty reasonable… To have dinner, there is always an option to go to a McDonald’s or Burger King style fast food on many of the central streets (to tell the truth there is an annoyingly high number of these restaurants there), but there is also an option to have dinner for about €30 (for 2 persons, with tip) in some of the more earthly priced restaurants also in the city center. There one can choose from traditional Viennese meals just to feel what Austrian people eat (or would like to think us, visitors, that they are eating 🙂 ) and to taste an Austrian middle class wine at a reasonable price. Some highlights and hints here.